Personal care supplies such as feminine care items, baby care products are the featured deals on pg 29. 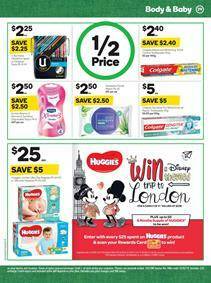 You can easily spot a good deal on Huggies jumbo ultra dry nappies on this part of the newest catalogue of Woolies. In the personal care section of this catalogue, there is a fine selection of hair and body care products. Find half-price deals on Head & Shoulders, Herbal Essences, OGX products including shampoo and conditioners. Hair colours for those who want to make a little change in life can be found on the same page. Woolworths has discounts on L'Oreal preference hair colour that is priced at $11.40. Also, new products like Love beauty planet bodywash, Natures commonscents paw paw body wash, organic care matcha green tea body wash with introductory prices are available on pg 30. Adidas, Brut deodorants, low carb protein bars, Nature's Way supplements are included items in the list of on-sale products. Moreover, Woolies also has household supplies range that covers chemical cleaners, cleaning items etc. Follow the Facebook page for instant notifications on updates of this page.